Living… near Lansford, Pennsylvania where Panther Valley Television, with the assistance of Jerrod Electronics, created the first cable television system. 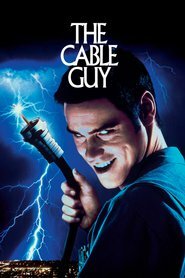 Profession… cable guy, which is not an easy job. Chip resents the presumptuousness of his customers: “You'd be surprised how many customers treat you like crap, like I'm a goddamn plumber or something.” Some customers even offer fifty bucks in exchange for free movie channels. It's very illegal, and in this state if convicted, you could be fined five-thousand dollars or spend six months in a correctional facility. Chip is usually by-the-book, but he made an exception for a recent client named Steven and gave him free cable during an installation. Interests… hanging out with Steven. They met about a week ago, but Chip feels like he’s known him his whole life. They play football together. Steven has let him into his relationship problems. And he’s gone into his house while Steven wasn't there. It's really moving fast. Relationship Status… on the rebound. Chip asked a woman to marry him once. As he sorrowfully recalls, “We agreed to take some time apart to re-assess our feelings. To give each other space. Well, she is no longer with us. Sometimes you don't have the time you think you have.” His main romantic advice now is just to make sure you don’t go bungee jumping in Mexico. Challenge… getting Steven to accept him into his life. Chip leaves messages on Steven’s machine night and day because he cares. But he is not sure Steven feels the same way about him. He fears Steven has just been manipulating him for free cable. Personality… friendly and upbeat but also psychopathic and creepy. Chip claims he has good intentions because he just wants to make friends, but he tries too hard and doesn’t take no for an answer. Ernie Douglas's popularity ranking on CharacTour is #3278 out of 5,000+ characters. See our top-ranked characters and read their profiles.